"In your article 'Organized Religion - Who Needs it?' you said that it is in accord with biblical principles that, by being organized, Christians can help a needy individual without the person being helped knowing who is helping him. Why do you hide the fact that the early Christians did not give alms at all but lived together, not having private property, sharing everything? (Acts 2:44; 4:32.)" The examples of early Christian "communism" you mention were the result of special circumstances. Using property communally was the custom in ancient Israel when large crowds would flock to Jerusalem during the holy day seasons. The residents of the city would open their homes free of charge to the newly arrived pilgrims at such times (see The Temple, Its Ministry and Services as They Were at the Time of Jesus Christ, by Alfred Edersheim). Since the early Christian Church first gathered at Pentecost, they were following the custom of their day. Furthermore, it was customary for poor people to eat of the Temple sacrifices, but priests were denying this opportunity to Christians. With large numbers of people to contend with, some provision had to be made to take care of many needy people. And these arrangements were not as communal as might appear at first glance. The story of Ananias and Sapphira occurs at this time of "communal" ownership. They were condemned, not for giving only part of the proceeds from the sale of their property to the apostles, but for pretending that they gave all of it (Acts 5:3). But notice that they still owned private property which, according to the apostle Peter himself, was their "own," and in their "own power" to dispose of as they pleased (Acts 5:4). However, the principle of giving private property to a common fund to be distributed to the needy is an undeniable principle of organized religion. Moreover, we know that the early Christians who lived outside of Jerusalem also owned private property: Paul's admonition to the Corinthians to help their stricken brethren in Jerusalem was made to individuals who owned property: "Every man according as he purposeth in his heart, so let him give... (II Cor. 9:7). two of the Ten Commandments presuppose private property. The two commandments — "Thou shalt not steal" and "Thou shalt not covet" — are not only implicit sanctions of private ownership of property, but also set it up as a moral right of man. "Could you straighten me out on this point? Since there is only one true Church set up by Jesus during His ministry, what is the meaning of Revelation 1:20?" A The essential meaning of Revelation 1:20 is, first of all, a biblical definition of the symbolic seven stars and seven golden candlesticks (meaning angels and churches respectively). The fact that seven churches (plural) are mentioned in no way means that God's Church is divided. "There is one body [the Church, Eph. 1:22-23]... one faith... (Eph. 4:4-5). Revelation was originally written to be circulated among seven local congregations (plural in churches) of the Church of God in Asia Minor (Rev. 1:4). Although separated geographically, these seven churches were all groups of the one true Church which Jesus founded (Matt. 16:18). "In the booklet 'The Plain Truth About Easter,' Mr. Armstrong states that the Church as the true body of Christ has existed continuously since the first century. What books should I consult in investigating this question for myself?" As the booklet explains, the true Church is composed of those — and only those — who have truly repented and have therefore received the Holy Spirit of God (Acts 2:38). These people are comparatively few in number, though the number of people claiming the name of "Christian" is large. The true Church is small (Luke 12:32). Furthermore, its people are scattered. But wherever they are, those Spirit-led individuals are the body of Christ. Historically, in addition to the large organizations of so-called Christians, smaller groups have always existed, standing for doctrines differing from the beliefs of the mainstream churches. You should be able to find encyclopedias in your local library which deal specifically with religious sects. You will want especially those dealing with the earlier periods of the Christian era. From these you can learn the names of so-called "heretical" groups, and read brief statements of their main beliefs and histories. Then you can inquire about more thorough works on such individual groups. We generally consider certain Ebionites, some of the Waldenses, Anabaptists, Paulicians, the earliest Seventh-Day Baptists, and several other groups as standing more or less in the direct lineage of the Church of God. But, remember, no organization is the body of Christ. Rather, the Church is an organism often composed of scattered individuals (see I Corinthians 12). And usually those individuals do not make historical headlines. They are therefore almost all but impossible to trace. "You have stated: 'The true church is [today] small, and its people are scattered. But remember, no organization is the body of Christ. Rather, the church is an organism often composed of scattered individuals (see I Cor. 12). The Bible completely disagrees with you! The Church of God is most definitely the body of Christ!" We must not confuse the Church of God, the body of Christ, with the configuration into which members of that body organize in order to achieve the goal of preaching the gospel in an orderly fashion. it is quite correct to say that the Church is the body of Christ. This body is a spiritual organism composed of those individuals who have been given the Holy Spirit by and from God. But these individuals may at different times in history organize into groups of people (the Greek word ekklesia, translated "church" in the New Testament, means "a group of people") dedicated to a common set of purposes. Organization, in this sense, is what the church has, not what it is. The Church of God today has an organized ministry, deacons, deaconesses and various other leaders or "governments" (see I Cor. 12:28). In I Corinthians 12 the apostle Paul likens the Church to a human body which has many members or parts. But this is only an analogy. The structure of the Church, in the physical sense, is merely a tool for doing a job. God has used various structures in different ages. Today the Church may have a corporate structure for the purpose of dealing with the world on its own business terms. But that corporation is not Christ's body — it is something that the body of believers uses to get the job done. "I have heard from several different people that it is very difficult to join the Worldwide Church of God. What is the story behind membership in your Church?" Acts 2:38 is an anchor verse to consider:... Repent, and be baptized every one of you in the name of Jesus Christ for the remission of sins, and ye shall receive the gift of the Holy Spirit,"
Membership in God's Church can only be obtained by receiving God's Holy Spirit upon real repentance — water baptism being symbolic of burial of the old self. "Do you believe that your Church is the only one that's right?" We know that God is right. And we know that Jesus said He would build His Church and that it would continue to exist to the end of the age. However, Christ also warned that there would be many false churches. He said that we need to beware (Matt. 24:4-5)! How then may we tell which is the true Church? But does this mean that we have exclusive rights to all truth? Not at all! Jesus said: "He that is not with me is against me; and he that gathereth not with me scattereth abroad" (Matt. 12:30). But He also said to His disciples when they wanted to rebuke a man who was casting out demons in Jesus' name: "...Forbid him not: for there is no man which shall do a miracle in my name, that can lightly [readily] speak evil of me. For he that is not against us is on our part" (Mark 9:39-40). It is not our function to judge all who use His name — whether in truth or in vain! We are here simply to preach the gospel of the Kingdom of God and to glorify God on this earth. We will leave the "judging and criticizing" others — for ultimately it is God who will judge all (Heb. 12:23; II Cor. 5:10). "What is the true Biblical name for the New Testament Church? And why is this name so important? Please explain in detail." In this world, churches are often named after men, or after the system men have devised, or the kind of church government men have thought out, contrary to God's Word, or after a significant doctrine they emphasize, or what men hope to make it-all-encompassing, universal or catholic. But wherever that ONE true Church is, it will be named the CHURCH OF GOD. Read Jesus' prayer in John 17:11, 12: "...Holy Father, keep through THINE own NAME those whom thou hast given me.... While I was with them in the world, I kept them IN THY NAME." It is clear from this scripture that the true Church is to be kept in the name of the Father. Since the name of the Father is God, the Church is simply named the Church of God. 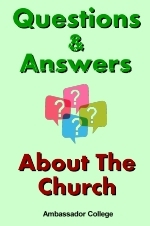 Twelve times in the New Testament, the Church is named the Church of God. 2) I Corinthians 10:32. "Give none offense, neither to the Jews, nor to the Gentiles, nor to the Church of God." 3) I Corinthians 11:22. "...or despise ye the church of God, and shame them that have not?" 4) I Corinthians 15:9. Paul wrote: "I persecuted the Church of God." 5) Galatians 1:13; This verse repeats the one last given — "I persecuted the church of God." 8) I Timothy 3:5, in speaking of an elder in a local congregation, Paul wrote Timothy: "For if a man know not how to rule his own house, how shall he take care of the church of God?" 9) I Timothy 3:15. "... Behave thyself' in the house of God, which is the church of the living God." 10) I Corinthians 11:16. "We have no such custom, neither the CHURCHES OF GOD." 11) I Thessalonians 2:14. "For ye, brethren, became followers of the churches of God which in Judea are in Christ Jesus." In some New Testament instances, a descriptive adjective is added to the name, as the Church of God at Corinth, or the Churches of God in Judea. And today, it is the Worldwide Church of God.